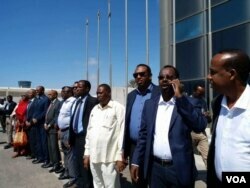 Somalia's Deputy Prime Minister Mahdi Mohamed Guled, members of parliament and representatives from civil society organizations welcomed the migrants at the airport. The migrants then told stories of abuse, fear and horror they had experienced in Libya. Abdikarim Mohamed Omar, 22, who shared his story with VOA's Somali service, was among those repatriated Saturday. He said he left Somalia in 2016 and traveled to Libya via Ethiopia and Sudan. "I was among 150 migrants packed into a truck by smugglers from Sudan — 100 Eritreans and 50 Somalis. They mercilessly forced us into a truck that fit only 30 people. Some of the Somali migrants were thrown out of the truck into the desert. Then we fought with the Eritreans for survival. Several of my friends were killed during the conflict," Omar said. "They lock us up in a room, where we hardly eat. You have no place to urinate. The room is overcrowded with migrants. Some of us sit the whole night, and some sleep a few hours. Every morning, they severely beat you with iron rods and sticks," he said. "To taste the pain and convince our parents to pay them, the smuggler woke us up with beatings early in the morning and send us to silence or sleep at night with beatings," Omar said. "It was like our daily greetings and the first communication between the smugglers and the detainees." He continued, "Because of the constant torture [and] hunger, many of the migrants in the detention room where I was died, including my Somali friend who shared a blanket with me." However, Amnesty International said in December 2017 that up to 20,000 people were being held in detention centers and were subject to "torture, forced labor, extortion and unlawful killings." "Following the order of President Mohamed Abdullahi Farmajo, the government has repatriated 10 Somali migrants from Libya and 30 more will be repatriated soon," said Guled, the deputy prime minister. The migrants have told government officials behind the repatriation effort that they have suffered during the journey to Libya but feel they have "nothing else to lose." 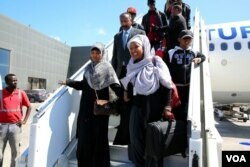 Mariam Yassin, special envoy for migrants and children's rights of Somalia, was among the delegation sent by the Somali government to Libya this week to try to persuade migrants to return home. She said those who returned Saturday had survived a harsh journey. "Among them are migrants who have spent three years in the hands of smugglers in Kufra, [in] south Libya. And now Allah saved them from the unbearable torments and torture they have been mentally and physically subjected to," Yassin said. Ahmed Abdikarim Nur, Somalia's commissioner of refugees and internally displaced persons, said because of the extent of the abuses they faced, some migrants could not openly tell their horrific stories. "They told us that they feel ashamed and embarrassed. ... They have been subjected to all inhumane abuses against mankind," Nur said. "Our plan is to repatriate all those who want to return home," Nur said.